Dear David & Bonnie – Yours received today. Buy and send us a steamboat. I am enclosing a check. Pay for the boat & postage and keep the balance for your wedding a. Again “Happy Anniversary,” somewhat belated. Next Sat. we should be in the moving process. The contractor was here today and thinks he will be ready to begin the remodeling in a week. John and Lea are coming next Sat. and stay with us for a week and help us with the moving. I hope it won’t be such a task as last time. We went to 118 Juniper Court this afternoon and carried brick from the walk which had to go for the new addition – to the patio. It is such a nice place (the patio) to spend an afternoon. I will be glad when I will be able to sit there and just look at the trees. Monday I am to go to Evanston for a meeting which will last until Fri. noon – then home to begin the big move. The young M.D. who is interested in our office came Thursday. Dad met him and showed him the office. Several businessmen also met with him and hope to get him interested. He can’t come – if he does – until mid August. P.S. 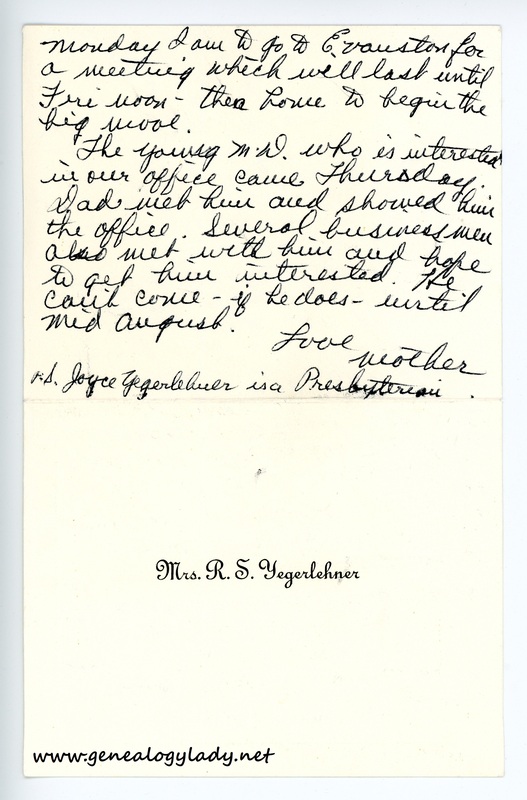 Joyce Yegerlehner is a Presbyterian. 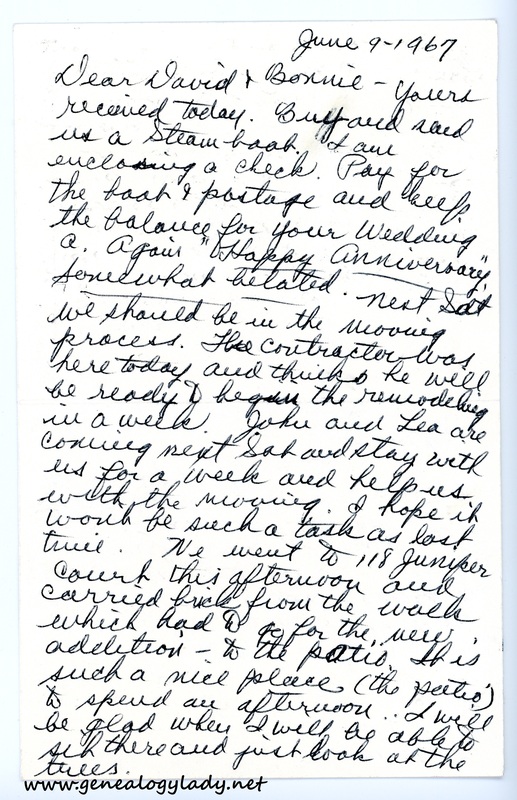 This entry was posted in Genealogy, Yegerlehner and tagged 1960s, Boston, Boston University School of Theology, David A. Yegerlehner, genealogy, Gladys R. (Foster) Yegerlehner, Indiana, John F. Yegerlehner, Joyce (Yegerlehner) FitzRandolph, Lafayette, Lena "Lea" (Keith) Gieselman, Massachusetts, Roscoe S. Yegerlehner on April 6, 2017 by Deborah Sweeney. ” Buy and send us a steamboat.” I guess Roscoe gave up on making one. How would he have done that anyway? “I will be glad when I will be able to sit there and just look at the trees.” And she loved feeding the raccoons at night! It was indeed a beautiful spot.